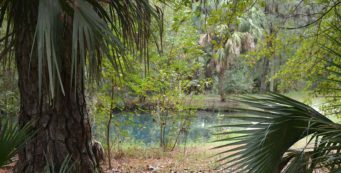 Silver Glen Springs | Florida Hikes! 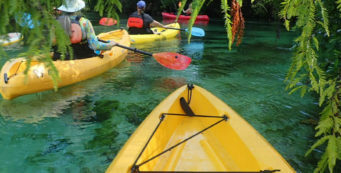 With a strong aquamarine hue broken by refracted rainbows as sunlight plays across the ripples on its sandy bottom, Silver Glen Springs is a first-magnitude spring in the Ocala National Forest, pouring its essence into a stream that flows into Lake George. It is an important archaeological site as well, edged by ancient middens thick with fossilized snail shells. Dogs are NOT permitted at Silver Glen Springs. 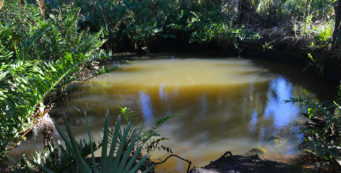 One of the beauty spots of the Ocala National Forest, Silver Glen Springs Recreation Area has also been “loved to death” over the decades. It is extraordinarily busy on weekends, and you’ll usually see a crowd of boats, including houseboats, in the spring run. You can best enjoy the spring’s natural features on a weekday. Stairs lead down into the water for swimming in the cool spring outflow. The main spring boil rages with tremendous power as it pushes the surface of the water upward above its deep sinkhole-shaped vent, blowing iridescent fossil snail shells upward like confetti, pouring 72 million gallons a day downstream into Lake George. 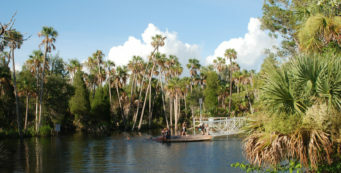 A second spring, the Natural Well, is roped off to keep swimmers out. But you can look down from the bluff above and see the swirls of fish inside. Canoe rentals are available, and there are two trails to explore at this recreation area. Lake George Trail- Connecting Silver Glen Springs with the river it feeds, the Lake George Trail provides an easy day hike to picturesque views of Lake George on the St. Johns River. 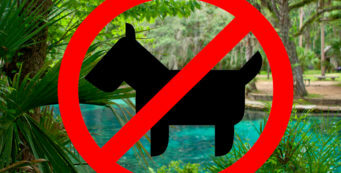 Ocala National Forest dog policy- Except for service dogs, dogs are no longer permitted in Alexander Springs, Salt Springs, Silver Glen Springs, Juniper Springs, Clearwater Lake, Fore Lake, Lake Dorr and Mill Dam Recreation Areas in the Ocala National Forest. 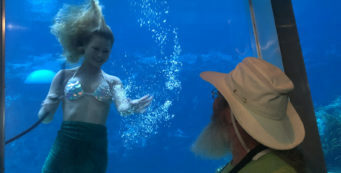 Spring Boils Trail- A delight to visit, the Spring Boils Trail showcases bubbling springs both big and small, starting within sight of the main springs at Silver Glen Springs before it leads you to coves of tiny bubblers.